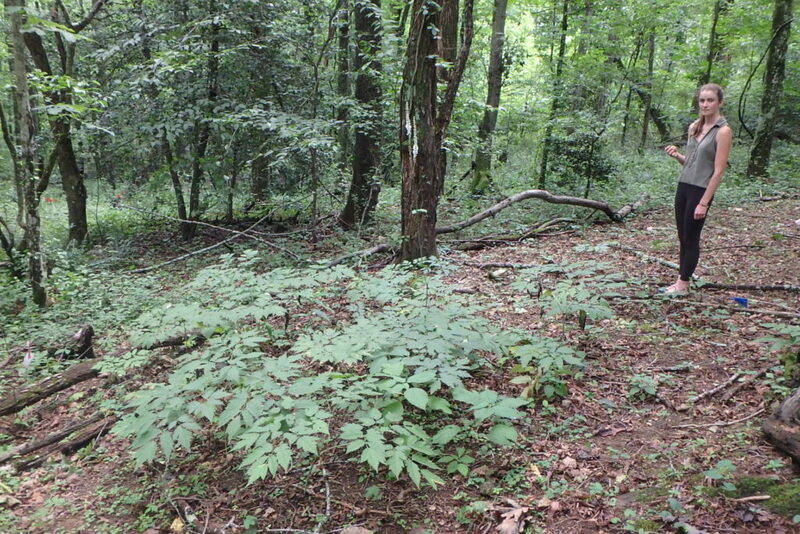 NC State Research Assistant inspecting black cohosh population. A large component of our Alternative Crops and Organics Program is devoted to medicinal herbs. Many of these are native forest herbs including ginseng, goldenseal, black cohosh, and bloodroot. The collection and sale of these native herbs have been a part of the life and culture of many mountain families. These herbs are personally used as medicine and as a source of income. The activity of “wild-harvesting”, also referred to as “wild-crafting” and “gathering”, is also a common seasonal outdoor activity for many people who engage in similar forest based sports such as hunting and fishing. There are many herbalists, herb schools, herb product manufacturers, and raw botanical material sourcing companies in our region whose businesses depend on these wild plants. 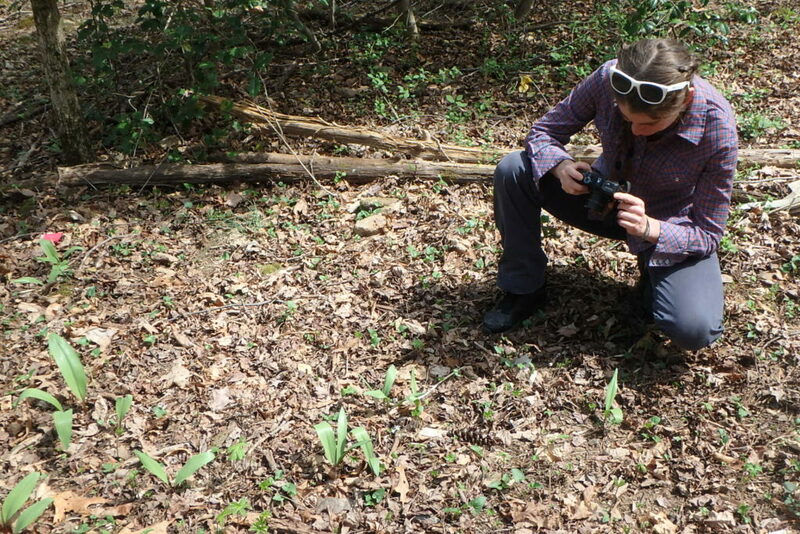 NC State research assistant inspecting a population of ramps in early spring. There are concerns about the conservation of some of these plants and the sustainability of wild-harvesting. In our program, we work with botanists and other forest scientists to study the effects of wild-harvesting on native populations and how cultivation of some of these herbs might reduce pressure on the wild populations. To many people, this would appear to be a “no-brainer”; just grow the plants and leave the wild ones along! But it is not that simple. Here is a link to a recent article entitled “The Wild World of Wildcrafting”. It does of great job of explaining this complicated business and culture. 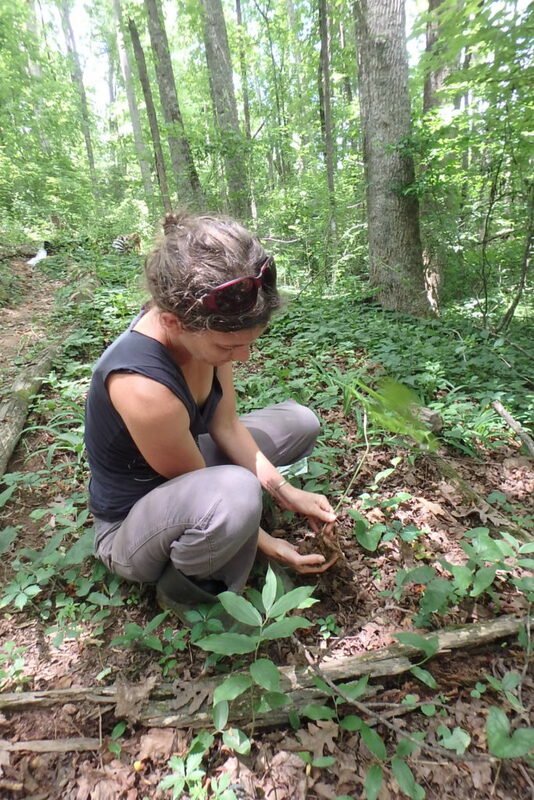 NC State research assistant planting forest botanicals. But at the same time, there are big efforts underway to train more people to be “forest farmers” of native medicinal herbs, mushrooms, and other forest products. One of the biggest projects in the eastern US is the Appalachian Beginning Forest Farmers Coalition of which we are very much engaged. This is a multi-state project with university, non-profit, and business partners. We have a very active role in this project and just this fall we held a weekend-long beginning forest farmer workshop at Warren Wilson College in Swannanoa, NC; a weekend-long workshop on value-added forest products at Montreat Conference Center in Montreat, NC; a 2.5 hour workshop on forest farming at the Sustainable Agriculture Conference in Durham, NC; we taught at the Transylvania County Ginseng Workshop in Mills River; and we exhibited at and sponsored the Organic Ginseng Workshop last weekend in Marshall, NC. All of these events were well-attended by enthusiastic people looking to generate income by growing native medicinal herbs in their woodlands. 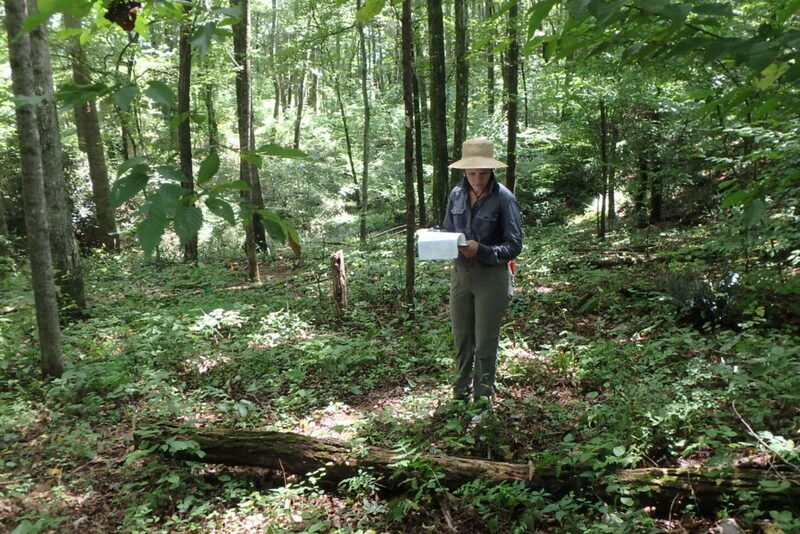 NC State research assistant collecting data on forest planting. If any of this is of interest to you, I encourage you to take a few minutes to read this article “The Wild World of Wildcrafting” and consider joining the Appalachian Beginning Forest Farmers Coalition .